1 pc. 17,00 EUR ea. 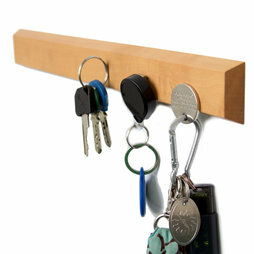 Magnetic key rack made of solid oiled peartree wood. Six powerful magnets are embedded on the back side of the wooden strip (see photos), so that your keys "magically" attach to this key rack. The magnetic strip is 1,9 cm thick, 3,9 cm wide on the back, and 2,9 cm wide on the back. 1 key rack 32 cm, 2 magnetic wall pins for wall attachment (see photos), assembly instructions & drilling jig. 1 pc. 69,25 EUR ea. 1 pc. 16,00 EUR ea. Modern keys are not magnetic, but key rings or post box keys are generally magnetic. 6 disc magnets are embedded on the backside. The magnetic wall pins are composed of a very strong magnet with a plastic sleeve. The sleeves are screwed into the wall (screws and rawlplugs are also included), the magnet is pressed-in and the key rack is simply "docked" with its own magnets on the sleeve.